Old Rishworthians completed a wide-margin Yorkshire One double over Old Crossleyans yesterday, scoring eight tries to their visitors’ one in a 58-10 success at Copley. Chris Stone’s men were retaining the Peter Lighting Trophy, contested by the clubs for the first time in almost 40 years at Broomfield in October, when the visitors came out on top by 39-7. It could be a long time before the silverware is dusted off again because Rishworthians are firmly on course for promotion to Yorkshire One - and likely derby dates with Old Brodleians and Heath - while Crocs face a battle to avoid a third successive relegation. Crocs will play much worse and get beaten by a much smaller margin than they did yesterday, but they found their second-placed hosts in determined mood after a defeat to champions-elect Moortown in their previous outing. The visitors stuck to their task gamely, with particularly good performances from teenage full back Joe Wilkinson, No 8 Ollie Coyne, James Wainwright and evergreen Andy Day, but Rishworthians were strong across the park and showed a real cutting edge on a wet surface. Rishworthians’ bonus-point success took them eight points clear of third-placed Pontefract with seven rounds of fixtures left. Crocs are third from bottom but coach Ian Yates remains convinced his side will stay up and said there would be much better opportunities than the game at Copley to pick up points. Home stand off Josh Kelly brought his backs onto the ball well and his booming boot accounted for 18 points, starting with a third-minute penalty which was matched by his opposite number Nathan Cooper on 12 minutes. Rishworthians had the stronger scrum and better kicking game. Heroics from Wilkinson, as the last line of defence, saved the visitors on three occasions in the first half but Crocs were unable to clear their lines. Centre Sam Nunn, returning from North of England Under 18 duty, dived over wide on the left for the opening try on 19 minutes and Stone was driven over from a lineout five minutes later. Kelly, who struck an upright with a penalty in between those tries, added both conversions for a 17-3 lead. A yellow card for visiting centre Jack Hammond proved costly as backs Anthony Shoesmith and Chris Flanagan, an early replacement for his injured brother Luke, added Rishworthians’ third and fourth tries towards the end of the half. Shoesmith gathered Nunn’s kick to the corner and Chris Flanagan juggled the ball but held on to it and completed a flowing pass move wide out on the other flank. Kelly was unable to add either conversion. Rishworthians extended their 27-3 interval lead with another converted try on 48 minutes. Wilkinson got back to hack the ball dead, only for home No 8 James Clarke to drive over following the subsequent five metre scrum. With rival front rowers Anthony Nathaniel and Richard Wheale in the sin-bin, Rishworthians skipper Fraser Swarbrooke cashed in on scrum half Ed Cockroft’s fine work and then Clarke plunge over for his second try. Kelly added both goals to make it 48-3 just after the hour mark. Crocs were in no mood to throw in the towel and after a lengthy spell on attack the hard-working Coyne was rewarded for his efforts with a try converted by Cooper. 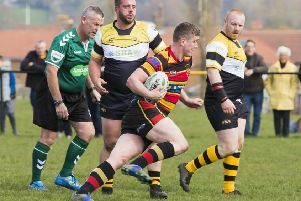 Rishworthians broke through the 50-point barrier when ace finisher Shoesmith made a weaving 40 metre run through the middle, Kelly converting and adding a final penalty. Rishworthians’ Development team had a fine 16-8 win at Aireborough against a team containing many of their hosts’ Yorkshire Three first team, who did not have a game. Rishworthian try scorers were Will Illingworth and Rhys Town, who also kicked two penalties.